Today’s chart shows the radiant point for December’s famous Geminid meteor shower. The 2010 shower is peaking around now. You might see some Geminid meteors on the night of December 11, but the forecast calls for them to be falling most richly after the moon sets on Sunday, December 12 and Monday, December 13 – from late at night until dawn. About the radiant point. You don’t have to locate a meteor shower’s radiant point to watch the shower. Since meteors in showers appear in all parts of the sky, any dark, open sky will do the trick. Just lie back comfortably and let your gaze wander to all parts of the sky. Still, since many people ask … the Geminid shower radiates from the constellation Gemini, as shown on today’s chart. That is how this shower got its name. 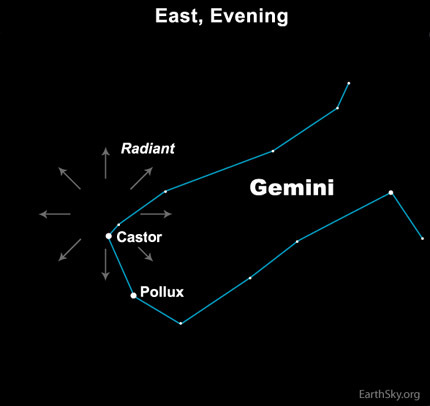 The meteors come from a point near the star Castor in Gemini, one of the brightest stars in the sky. If you watch this shower – and trace the paths of the meteors backwards on the sky’s dome – you will find that the meteor’s paths seem to converge at a point in the sky near this star. It is like standing in the middle of railroad tracks; gazing down the tracks and watching them converge in the distance. Meteor shower radiant points are kin to this illusion. To see Castor, look fairly low in the east-northeast sky around 9 p.m. Castor and the Geminid meteor shower radiant swing upward through the night, and climb pretty much overhead by around 2 a.m. Here’s what is important about a meteor shower’s radiant point: the higher the radiant rises into in your sky, the more meteors you’ll likely to see. That means you can expect to see the most Geminids around 2 a.m., when Castor will be highest in the sky, and the meteors will be raining down from overhead. The moderately fast Geminid meteors tend to be bright. The exact number you can see varies with a number of factors, but 40 to 90 per hour at peak is a reasonable estimate. Since the peak of a meteor shower is not all that easy to predict with absolute precision, meteor watching enthusiasts will be watching the Geminids for the next several nights. By the way, meteors in annual showers – like the Geminids – stem from debris left behind by comets as they orbit the sun. A meteor shower’s radiant point represents the direction in the sky at which Earth’s orbit intersects the orbit of that (usually) long-lost comet. The parent object of the Geminids is very special. It looks more like an asteroid than a comet, and it has an asteroid name: 3200 Phaethon. Perhaps the link between comets and asteroids is closer than we think! Geminid meteor storm from 3200 Phaethon? Site contents copyright © 2019 Recorder Online	except as noted. All rights reserved. | 83 queries in 1.693 seconds.